Faulty Towers The Dining Experience is site-specific immersion theatre, and is suitable for public performances, and for private showings of the full performance. Corporate performances by the Faulty Towers performers are also available (see other options). The performance is fully interactive and highly improvised. It portrays the spirit of the characters from the Fawlty Towers TV series and the atmosphere they create, but does not use their original TV scripts. Faulty Towers A One Night Stand is a new show written specially for events such as awards celebrations, customer parties – even weddings: any event, in fact, where you might want the spirit and fun of Faulty Towers The Dining Experience but need to be more flexible and not fixed to that show’s 2-hour format or to a set audience size. Tailor-made to your event, Faulty Towers A One Night Stand features Basil Faulty as the Master of Ceremonies presenting an evening of prizes and awards. 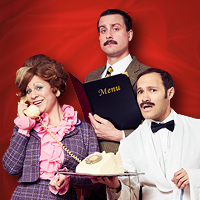 He is joined by his wife, Sybil, and – of course – Manuel as the glamorous assistant. The show is an hour of interactive theatre comprising scripted and improvised comedy set at an awards night, family celebration or prize-giving. Individual guests become part of the production, while other guests enjoy star performances by their friends under Basil Faulty’s ‘guidance’. This show can be adapted for small or large audiences and performed in hotel function rooms, conference rooms, theatres or stadiums. It can be presented as one full hour or three 20-minute set pieces over a period of two hours. Catering is at the discretion of the client. 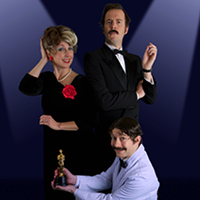 A taste of Faulty Towers is another specifically designed option for conferences and private functions. Suitable for sit-down meal functions where guests want to chat, network, or sit back and relax, the team will add a sense of fun to the atmosphere. The performers meet, greet, mingle and assist with service of the meal over a full 2-hour time-frame. No focussed theatrical pieces are presented, but at all times over the two hours there is at least one performer in the room.